High-profile cases of exploding e-cigarettes and vaping devices have made front-page news in recent months. In January 2019, a Texas man died after a vape pen he was using exploded in his face. This followed a similar death of a Florida man in May 2018, which was believed to be the first death from an exploding e-cigarette or vape device. January and February of this year saw two different instances of vaping devices exploding while in overhead storage on commercial flights. Overall, there have been hundreds of e-cigarette fire and explosion incidents reported in the United States over the past several years, with those instances increasing in number as the popularity of vaping increases. Plaintiffs’ attorneys have been quick to follow this trend. Several national firms have been targeting these cases and have filed numerous lawsuits on behalf of persons harmed by explosions and fires involving vaping devices. Although Minnesota has yet to see an avalanche of these lawsuits like other jurisdictions, several Minnesota plaintiffs’ firms have begun to target similar cases and advertise to prospective clients who have been harmed by vaping devices. If Minnesota follows the national trend, we can expect to see an increase in these cases here. Many of these incidents involve explosions inside users’ pockets when carrying spare lithium-ion batteries for vape devices. These batteries can short out and initiate a thermal runaway if they are damaged or come into contact with conductors like coins, keys, or another battery. Many other incidents typically involve so-called “mods” or mechanical modified vape devices, which are larger than traditional e-cigarettes and utilize higher-powered batteries to produce more vapor. Explosions and fires involving mechanical mods can occur when high-powered lithium-ion battery cells are utilized in poorly-designed and/or manufactured mod devices that lack adequate safety protections. Manufacturers, retailers, and distributors of e-cigarettes—as well as makers of lithium-ion battery cells used in e-cigarettes—are likely to find themselves defending against fire and explosion claims involving these products. Many claims alleging product defects in e-cigarettes and vaping devices can be disproven or defended against by thorough investigation and failure analysis, and instead attributed to product misuse, abuse, and failure to heed warnings. Manufacturers and retailers of vaping devices can also mitigate their liability risks by including appropriate warnings and instructions with their products. 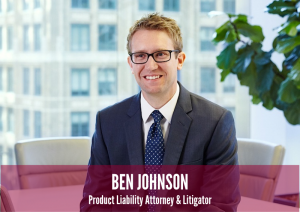 To contact Ben Johnson about e-cigarette or lithium-ion battery litigation or product warnings, email Ben at bcjohnson@nilanjohnson.com or call 612.305.7693.